Stuttgart, October 9, 2018. 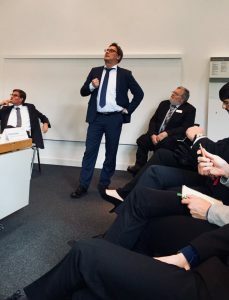 Michael Winter and Karen Frauen of Stakeholder Reporting spoke today at the German CSR Forum in Stuttgart, an important symposium for sustainability dialogue between business leaders, policymakers, NGOs, the media, and sustainability professionals. They presented a new strategic approach to materiality analysis that meets the challenges of compliance with new mandatory non-financial reporting. The approach gives organizations a comprehensive methodology for conducting a materiality analysis: from identifying their CSR topics and assessing the perspectives of their internal and external stakeholders to reporting and managing the results.By linking risk and impact, the approach enables organizations to conduct an individually tailored dialogue with their various stakeholder groups and to manage their CSR topics effectively. In short, it becomes a strategy tool. 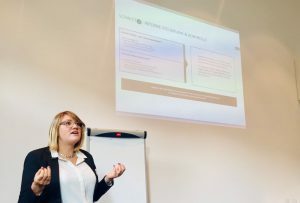 Stakeholder Reporting offers a basic version of its materiality analysis (which supports compliance with the German CSR Directive Implementation Act) and an advanced version (which contains additional features that facilitate the efficient management and communication of CSR topics). Both versions are compatible with an audited reporting process. Once in place, the process can be updated annually with little effort.